Peterborough Northern Star Blue breezed into the semi-finals of the Under 15 PFA Cup on Sunday. 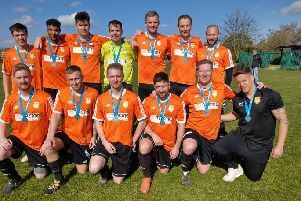 The Division One title-chasers proved too strong for Division Two opponents Thorpe Wood Rangers Blue and cantered to an 8-0 win. James Pam smashed a hat-trick to take his tally for the season to 36 goals with Ahmad Babakarkhil (2), Henry Lunga, Jack Wilson and Frederico Rocha completing the rout. In two other quarter-finals played on Sunday, Division One table-toppers Holbeach beat plucky Ketton from Division Two 2-1 while Feeder came from 2-1 down at half-time to beat Wisbech St Mary 3-2 in the all-Division Two tie thanks to goals by Jordan Lee, Mitchell Pillin and Luke Whitehead. In Under 16 Division One, the top two sides both had to fight hard for victory. After a goalless first-half, league leaders Stamford Red eventually managed to beat Bourne 2-0 with two goals from substitute Oliver Wood. It was also tough for second-placed Deeping Rangers Blue at Peterborough Sports. They eventually edged home 1-0 thanks to a Scott Waumsley strike.